Sudden cardiac arrest is a situation that occurs when the heart suddenly stops beating effectively and blood is not circulated by the heart; about 95% of individuals that have sudden cardiac arrest die from this condition. Sudden cardiac arrest is usually due to an arrhythmia (irregular heartbeat) that causes the heart to stop pumping blood to the body. 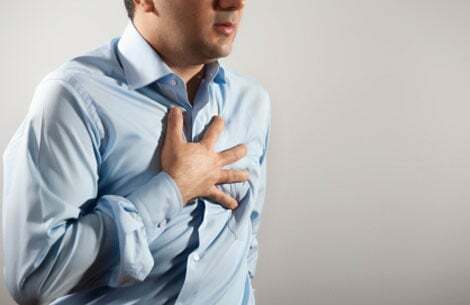 People at risk for sudden cardiac arrest include individuals with coronary artery disease, severe physical stress, individuals with electrical or structural changes in the heart, and those with inherited cardiac disorders. The first sign of sudden cardiac arrest may be loss of consciousness (fainting) and/or no heartbeat or pulse; some individuals may have a racing heartbeat, dizziness, chest pain and shortness of breath, nausea or vomiting before a sudden cardiac arrest occurs - many individuals have no signs whatsoever and simply collapse. Sudden cardiac arrest is usually diagnosed after it occurs: physicians may utilize tests such as EKG's, MUGA, cardiac catheterization, electrophysiology tests and blood tests on those patients that survive an arrest to determine underlying causes. Treatment of a sudden cardiac arrest requires a defibrillator to shock the heart to restore a normal rhythm to the heart; this defibrillation must be done within a few minutes of the sudden cardiac arrest to be effective. Preventing sudden cardiac arrests centers on reducing the known causes that contribute to cardiac arrest such as lifestyle changes to prevent coronary artery disease, healthy diets, reducing stress, and getting regular exercise; for individuals with heart problems, taking the appropriate medications and adjusting their lifestyle may reduce risk – some individuals that have survived a sudden cardiac arrest and a few others that have electrophysiological problems may benefit from an implanted cardiac defibrillator (ICD) that detects arrhythmias automatically and then shock the patient's heart back into a normal rhythm. Sudden cardiac arrest (SCA) is a condition in which the heart suddenly and unexpectedly stops beating. When this happens, blood stops flowing to the brain and other vital organs. Sudden cardiac arrest usually causes death if it's not treated within minutes. To understand sudden cardiac arrest, it helps to understand how the heart works. The heart has an internal electrical system that controls the rate and rhythm of the heartbeat. Problems with the electrical system can cause abnormal heart rhythms called arrhythmias (ah-RITH-me-ahs). There are many types of arrhythmias. During an arrhythmia, the heart can beat too fast, too slow, or with an irregular rhythm. Some arrhythmias can cause the heart to stop pumping blood to the body. These are the type of arrhythmias that cause sudden cardiac arrest. Sudden cardiac arrest is not the same as a heart attack. A heart attack occurs when blood flow to part of the heart muscle is blocked. During a heart attack, the heart usually doesn't suddenly stop beating. Sudden cardiac arrest, however, may happen after or during recovery from a heart attack. People who have heart disease are at increased risk for sudden cardiac arrest. However, most sudden cardiac arrests happen in people who appear healthy and have no known heart disease or other risk factors for sudden cardiac arrest. Ninety-five percent of people who have sudden cardiac arrest die from it—most within minutes. Rapid treatment of sudden cardiac arrest with a defibrillator can be lifesaving. A defibrillator is a device that sends an electric shock to the heart to try to restore its normal rhythm. Automated external defibrillators (AEDs), which often are found in public places like airports and office buildings, can be used by bystanders to save the lives of people who are having sudden cardiac arrest. Most cases of sudden cardiac arrest (SCA) are due to ventricular fibrillation v-fib). V-fib is a type of arrhythmia. In v-fib, the ventricles (the heart's lower chambers) don't beat normally. Instead, they quiver very rapidly and irregularly. When this happens, the heart pumps little or no blood to the body. V-fib is fatal if not treated within a few minutes. Other electrical problems in the heart also can cause sudden cardiac arrest. For example, sudden cardiac arrest can occur if the rate of the heart's electrical signals becomes very slow and stops. Sudden cardiac arrest also can occur if the heart muscle doesn't respond to the heart's electrical signals. Several research studies are under way to try to find the exact causes of sudden cardiac arrest and how to prevent them. CAD occurs when a fatty material called plaque (plak) builds up in the coronary arteries. These arteries supply your heart muscle with oxygen-rich blood. Plaque narrows the arteries and reduces blood flow to your heart muscle. Eventually, an area of plaque can rupture, causing a blood clot to form on the surface of the plaque. A blood clot can mostly or completely block the flow of oxygen-rich blood to the part of the heart muscle fed by the artery. This causes a heart attack. During a heart attack, some heart cells die and are replaced by scar tissue. This damages the heart's electrical system. The scar tissue may cause electrical signals to spread abnormally throughout the heart. These changes increase the risk for dangerous ventricular arrhythmias and sudden cardiac arrest. CAD seems to be the cause of most cases of sudden cardiac arrest in adults. Many of these adults, however, have no signs or symptoms of CAD before having sudden cardiac arrest. Intense physical activity. The hormone adrenaline is released during intense physical activity. This hormone can trigger sudden cardiac arrest in people who have other heart problems. Very low blood levels of potassium or magnesium. These minerals play an important role in your heart's electrical signaling. A tendency to have arrhythmias runs in some families. This tendency is inherited, which means it's passed from parents to children. Members of these families may be at increased risk for sudden cardiac arrest. An example of an inherited disorder that makes you more likely to have arrhythmias is long QT syndrome(LQTS). LQTS is a disorder of the heart's electrical activity due to problems with tiny pores on the surface of heart muscle cells. LQTS can cause sudden, uncontrollable, dangerous heart rhythms. People who inherit structural heart problems also may be at increased risk for sudden cardiac arrest. Many cases of sudden cardiac arrest in children are due to these problems. Changes in the heart's normal size or structure may affect its electrical system. Examples of such changes include an enlarged heart due to high blood pressure or advanced heart disease. Heart infections also may cause structural changes in the heart. Sudden cardiac arrest occurs most often in people in their mid-thirties to mid-forties. It appears to affect men twice as often as women. Sudden cardiac arrest rarely occurs in children unless they have inherited problems that make them likely to have sudden cardiac arrest. Only a very small number of children have sudden cardiac arrest each year. The major risk factor for sudden cardiac arrest is undiagnosed coronary artery disease (CAD). Most people who have sudden cardiac arrest are later found to have some degree of CAD. Most of these people don't know that they have CAD until sudden cardiac arrest occurs. Their CAD is "silent"—that is, it has no signs or symptoms. Because of this, doctors and nurses have not detected it. Most cases of sudden cardiac arrest happen in people who have silent CAD and who have no known heart disease prior to sudden cardiac arrest. Many people who have sudden cardiac arrest also have a silent, or undiagnosed, heart attack before sudden cardiac arrest happens. These people have no obvious signs of heart attack, and they don't even realize that they've had one. The chances for having sudden cardiac arrest are higher during the first 6 months after a heart attack. What Are the Signs and Symptoms of Sudden Cardiac Arrest? Usually, the first sign of sudden cardiac arrest (SCA) is loss of consciousness (fainting). At the same time, no heartbeat (or pulse) can be felt. Some people may have a racing heartbeat or feel dizzy or lightheaded just before they faint. Within an hour before sudden cardiac arrest, some people have chest pain, shortness of breath, nausea (feeling sick to the stomach), or vomiting. Sudden cardiac arrest (SCA) happens without warning. It requires immediate emergency treatment. Doctors rarely can diagnose sudden cardiac arrest with medical tests as it's happening. Instead, sudden cardiac arrest often is diagnosed after it happens. Doctors do this by ruling out other causes of a person's sudden collapse. If you're at high risk for sudden cardiac arrest, you may see a cardiologist. This is a doctor who specializes in heart diseases and conditions. Your cardiologist will work with you to decide whether you need treatment to prevent sudden cardiac arrest. Doctors use several tests to help detect the factors that put people at risk for sudden cardiac arrest. An EKG is a simple, painless test that records the heart's electrical activity. This test is used to detect and locate the source of several heart problems. An EKG shows how fast the heart is beating and the heart's rhythm (steady or irregular). It also records the strength and timing of electrical signals as they pass through each part of the heart. An EKG may show whether you've had a heart attack. Echocardiography (EK-o-kar-de-OG-ra-fee) is a painless test that uses sound waves to create pictures of your heart. It provides your doctor with information about the size and shape of your heart and how well your heart's chambers and valves are working. The test also can find areas of heart muscle that aren't contracting normally due to poor blood flow or injury from a previous heart attack. There are several different types of echocardiography, including stress echocardiography. This type is done both before and after a cardiac stress test. During this test, you exercise or take medicine (given by your doctor) to make your heart work hard and beat fast. Stress echocardiography shows whether you have decreased blood flow to your heart (a sign of coronary artery disease). A MUGA test shows how well your heart is pumping blood. For this test, a small amount of radioactive substance is injected into a vein and travels to your heart. The substance releases energy, which special cameras outside of your body detect. The cameras use the energy to create pictures of different parts of your heart. Cardiac magnetic resonance imaging (MRI) is a safe procedure that uses radio waves and magnets to create detailed pictures of your heart. The test creates images of your heart as it is beating, producing both still and moving pictures of your heart and major blood vessels. Doctors use cardiac MRI to get images of the beating heart and to look at the structure and function of the heart. Cardiac catheterization is a procedure used to diagnose and treat certain heart conditions. A long, thin, flexible tube called a catheter is put into a blood vessel in your arm, groin (upper thigh), or neck and threaded to your heart. Through the catheter, your doctor can do diagnostic tests and treatments on your heart. Sometimes a special dye is put into the catheter to make the inside of your heart and blood vessels show up on x rays. The dye can show whether plaque has narrowed or blocked any of your coronary arteries. You may have blood tests to check the levels of potassium, magnesium, and other chemicals in your blood that play an important role in your heart's electrical signaling. Sudden cardiac arrest (SCA) requires immediate treatment with a defibrillator. This device sends an electric shock to the heart. The electric shock may restore a normal rhythm to a heart that's stopped beating. To work well, defibrillation must be done within minutes of sudden cardiac arrest. With every minute that passes, the chances of surviving sudden cardiac arrest drop rapidly. Police, emergency medical technicians, and other first responders usually are trained and equipped to use a defibrillator. Call 9–1–1 right away if someone has signs or symptoms of sudden cardiac arrest. The sooner help is called, the sooner potentially lifesaving treatment can be done. Automated external defibrillators (AEDs) are special defibrillators that untrained bystanders can use. These devices are becoming more available in public places like airports, office buildings, and shopping centers. AEDs are programmed to give an electric shock if they detect a dangerous arrhythmia, such as ventricular fibrillation. This prevents giving a shock to someone who may have fainted but isn't having sudden cardiac arrest. Cardiopulmonary resuscitation (CPR) should be given to a person having sudden cardiac arrest until defibrillation can be done. People who are at risk for sudden cardiac arrest may want to consider having an AED at home. Currently, one AED, the Phillips HeartStart Home Defibrillator, is sold over-the-counter for home use. The benefits of home-use AEDs are still debated. Some people feel that placing these devices in homes will save many lives, because many sudden cardiac arrests occur at home. Others note that no evidence supports the idea that home-use AEDs save more lives. These people fear that people who have AEDs in their homes will delay calling for help during an emergency. They're also concerned that people who have home-use AEDs will not properly maintain the devices or forget where they are. A large study on AEDs is currently under way. It may provide information on the pros and cons of having an AED in the home. When considering a home-use AED, talk to your doctor. He or she can help you decide whether having an AED in your home will benefit you. If you survive sudden cardiac arrest, you usually will be admitted to a hospital for observation and treatment. In the hospital, your medical team will closely watch your heart. They may give you medicines to try to reduce the chance of another sudden cardiac arrest. While in the hospital, your medical team will try to find out what caused your sudden cardiac arrest. If you're diagnosed with coronary artery disease, you may have angioplasty or coronary artery bypass grafting. These procedures help restore blood flow through narrowed or blocked coronary arteries. Often, people who have sudden cardiac arrest get a device called an implantable cardioverter defibrillator (ICD). This small device is surgically placed under the skin in your chest or abdomen. An ICD uses electric pulses or shocks to help control dangerous arrhythmias. How Can Death Due to Sudden Cardiac Arrest Be Prevented? If you've already had sudden cardiac arrest, you're at high risk of having it again. Research shows that an implantable cardioverter defibrillator (ICD) reduces the chances of dying from a second sudden cardiac arrest. An ICD is surgically placed under the skin in your chest or abdomen. The device has wires with electrodes on the ends that connect to your heart's chambers. The ICD monitors your heartbeat. If the ICD detects a dangerous heart rhythm, it gives an electric shock to restore the heart's normal rhythm. Your doctor may give you medicine to limit irregular heartbeats that can trigger the ICD. The illustration shows the location of an implantable cardioverter defibrillator in the upper chest. The electrodes are inserted into the heart through a vein. An ICD isn't the same as a pacemaker. The devices are similar, but have some differences. Pacemakers only give off low-energy electrical pulses. They're often used to treat less dangerous heart rhythms, such as those that occur in the upper chambers of the heart. Most new ICDs work as both pacemakers and ICDs. If you have severe coronary artery disease (CAD), you're at increased risk for sudden cardiac arrest. This is especially true if you've recently had a heart attack. Your doctor may prescribe a type of medicine called a beta blocker to help lower your risk for sudden cardiac arrest. Other treatments for CAD, such as angioplasty or coronary artery bypass grafting, also may lower your risk for sudden cardiac arrest. Your doctor also may recommend an ICD if your risk for sudden cardiac arrest is very high. CAD seems to be the cause of most cases of sudden cardiac arrest in adults. CAD also is a major risk factor for angina (chest pain or discomfort) and heart attack, and it contributes to other heart problems. Following a healthy lifestyle can help you lower your risk for CAD, sudden cardiac arrest, and other heart problems. A healthy diet is an important part of a heart healthy lifestyle. Choose a variety of fruits, vegetables, and grains; half of your grains should come from whole-grain products. Choose foods that are low in saturated fat, trans fat, and cholesterol. Healthy choices include lean meats, poultry without skin, fish, beans, and fat-free or low-fat milk and milk products. Choose and prepare foods with little sodium (salt). Too much salt can raise your risk for high blood pressure. Recent studies show that following the Dietary Approaches to Stop Hypertension (DASH) eating plan can lower blood pressure. Choose foods and beverages that are low in added sugar. If you drink alcoholic beverages, do so in moderation. Aim for a healthy weight by staying within your daily calorie needs. Balance the calories you take in with the calories you use while doing physical activity. Be as physically active as you can. Some people should get medical advice before starting or increasing physical activity. For example, talk to your doctor if you have a chronic (ongoing) health problem, are on medicine, or have symptoms such as chest pain, shortness of breath, or dizziness. Your doctor can suggest types and amounts of physical activity that are safe for you. Quitting smoking. Talk to your doctor about programs and products that can help you quit. Also, try to avoid secondhand smoke. Losing weight if you're overweight or obese. Treating other health problems, such as high blood pressure, high blood cholesterol, and diabetes. On June 25, 2009, paramedics were called to the home of Michael Jackson responding to calls that he wasn't breathing. They found him in cardiac arrest and started CPR. He was transported to UCLA medical center were numerous attempts to restart his heart failed and he was pronounced dead. Every day, calls come into the 911 emergency dispatch centers across the country with frantic voices crying for help. A person can't be wakened, breathing has stopped, and a pulsecan't be felt. Cardiac arrest, the failure of the heart's electrical conducting system to generate a heart beat, marks the end of life. No matter what the cause, death happens when the heart stops beating. The heart is an electrical pump. The mechanical pumping action that circulates blood requires an organized electrical system to get the heart muscleto squeeze. There are many reasons for the electrical activity to fail, and it's almost always due to irritable heart muscle cells that, in effect, cause a short circuit. National Heart Lung and Blood Institute; "What is Sudden Cardiac Arrest." What was your experience with sudden cardiac arrest? What caused your sudden cardiac arrest?